Pasadena has a literal fork in the road. 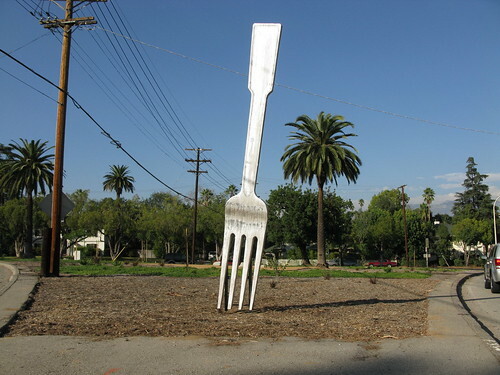 Where South St. John and Pasadena Avenues divide, there’s an 18-foot wooden fork in the median. The art was originally intended as a birthday joke for Bob Stane, who celebrated his 75th birthday Oct. 29, but the city and Caltrans, which owns the median, are in talks to keep it temporarily. “He was hysterical. He loved it,” said Stane's wife, Beverly, of Altadena. Stane first playfully suggested that the location might be appropriate for a fork monument about 10 years ago in conversation with a friend, Ken Marshall, Beverly said. Marshall had the idea brewing ever since. “Bob had no idea it was coming,” she said. The art, which has been on display since Oct. 31, may become a temporary guerrilla art installation, said Ann Erdman, the spokeswoman for the city. Though there are many “ifs” associated with the project, there’s been a lot of enthusiasm in the community for the art, she said. Before the fork can stay in the road, there must be a safety inspection to ensure that the fork is properly engineered. Marshall, who carved and built the fork, would have to pay the costs of the inspection, so taxpayers don’t have to underwrite the cost. 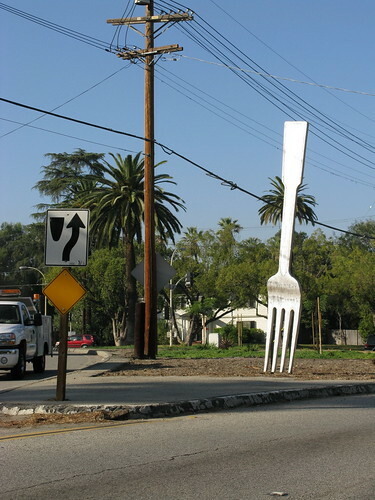 Once the temporary extension has run out, Marshall could go through a process with Caltrans art staff and the Pasadena Arts Commission to keep the fork in place.